The Hart Law Firm is the small firm the big firms hire when needing excellence in personal injury litigation. 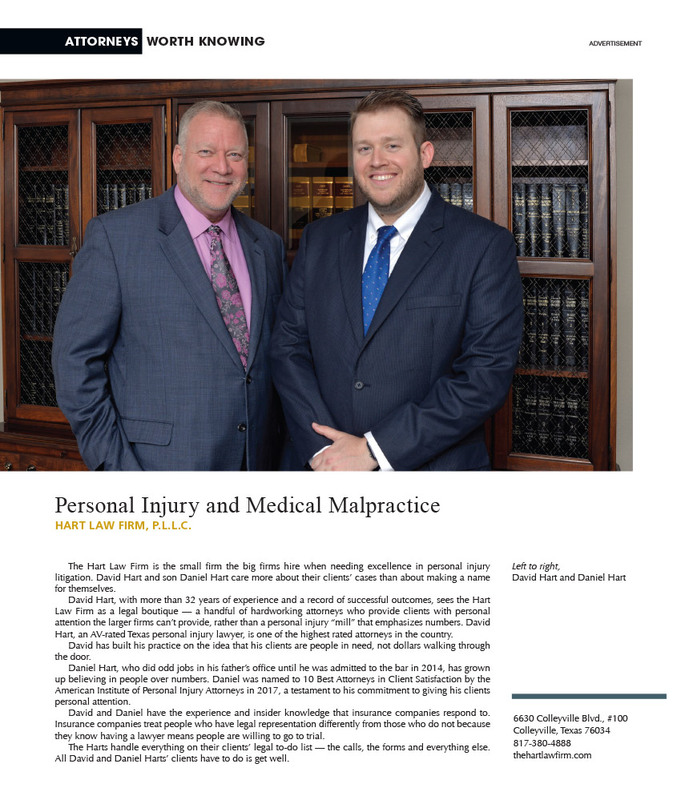 David Hart and son Daniel Hart care more about their clients’ cases than about making a name for themselves. David Hart, with more than 32 years of experience and a record of successful outcomes, sees the Hart Law Firm as a legal boutique — a handful of hardworking attorneys who provide clients with personal attention the larger firms can’t provide, rather than a personal injury “mill” that emphasizes numbers. David Hart, an AV-rated Texas personal injury lawyer, is one of the highest rated attorneys in the country. David has built his practice on the idea that his clients are people in need, not dollars walking through the door. Daniel Hart, who did odd jobs in his father’s office until he was admitted to the bar in 2014, has grown up believing in people over numbers. Daniel was named to 10 Best Attorneys in Client Satisfaction by the American Institute of Personal Injury Attorneys in 2017, a testament to his commitment to giving his clients personal attention. David and Daniel have the experience and insider knowledge that insurance companies respond to. Insurance companies treat people who have legal representation differently from those who do not because they know having a lawyer means people are willing to go to trial. The Harts handle everything on their clients’ legal to-do list — the calls, the forms and everything else. All David and Daniel Harts’ clients have to do is get well.